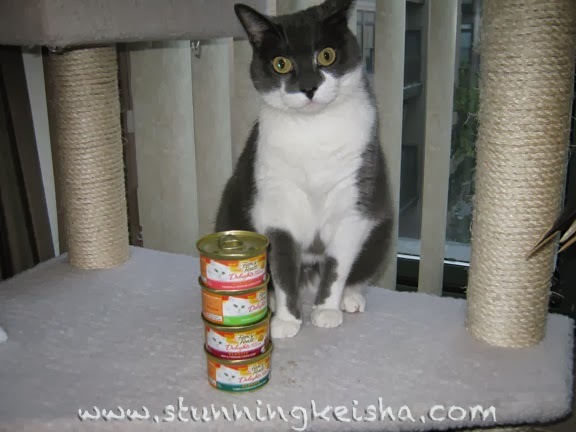 Why am I posing with 4 cans of cat food? Ax TW. I should be eating it. CK: Answer the phone, Woman. Rick: Your cat has a small package. Laughter at both ends, as if there's something funny about me having a small package. I'm a small cat! Good things come in small packages. I mean, am I the only cat in the complex who gets packages? How sad for the others. TW went shopping and then finally picked up the package hours later on her way back. Then she kept me in suspense for even more hours. What's funny is when one of them get a package, they're ripping it open in the elevator coming upstairs. They can't even wait until they get in the apartment. MY packages sit and sit unopened, sometimes for days. The first thing I noticed when she brought it upstairs was the condition of the box. It looked like some kitty at Postal Central had tried to get his paws into it. Maybe a bomb-sniffing dog at the airport mistook it for dog food. I don't know, but the USPS has to do a better job then this. 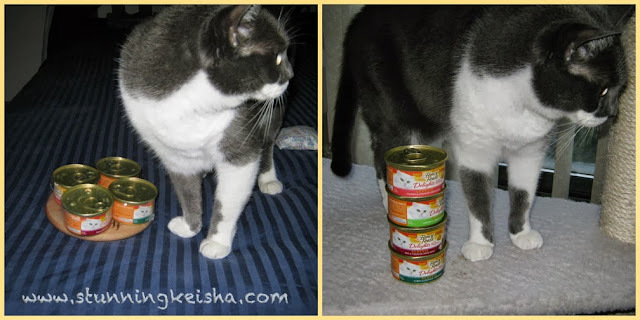 The package was a prize I had won on Sparkle's blog from Fancy Feast: four cans of Fancy Feast Pâté with cheese and a piece of wood for TW. I wasn't sure I was gonna give her the wood, which she told me it was a cheese board, after she held the food hostage but she grabbed it with her grubby paws and took off with it. Here are her attempts at a photo session with me and the ripped up package. Then she tried getting me to pose with the contents of the package. Humans never learn, do they. Another epic fail. Maybe, just maybe, she should've planned on giving me a can of the FF over the weekend since she was so hepped on making this a Monday post. That's very poor planning on her part. It's not like I got the package on Monday. It came Thursday. If I ever get to try it, I'll report back. Thank you, Sparkle, for this wonderful giveaway. UPDATE! TW gave me half a can of the salmon with cheese for breakfast and I pretty much hosed it down. It wasn't bad. TW made a crack that my cholesterol was gonna go up if I ate a lot of cheese. MOL. I won't give you a full review since, frankly, Fancy Feast ain't paying me for one. We're still cracking up over "small package." MOL!!!!!!! Just make sure TW mooshes up your pate nicely. Presentation is everything. Yummy! That is our favorite. Well, one of them anyway. Concatulations on your win, CK! We got a package just like that and will be doing our own post about it! Did you get to try yours yet?? I'm glad the Fancy Feast humans finally got the prize packages out! Apparently they had been sitting in the mailroom for a while. Maybe that is why they were sort of beat up. Hope you like the flavors! We love all packages and parcels but we say a grrrrr to the ones that kicked around like footballs. Enjoy your Fancy Feasts. Have a marvellous Monday. What's TW waiting for? Those cans are just screaming to be opened and tasted! That was a pretty cool box they were shipped in, but sadly not big enough to sit in. That's what happens when you have (wait for it) a small package. We hope the Fancy Feast is really tasty! That is a cool prize CK but the cans should sure be open!!! Oh yay you won such great giveaway! I love the cheese-shaped package. So Cute! But yes, I think it was kitty at postal central who did some damage on your package! Ha ha - what a great package you got. Did I read "small." TW maybe needs new glasses. CK I got one of those this weekend too! Can't wait for MomKatt to break it out! Let me know if you like it! Your face in the first pic just about says it all, CK!!! I think you did a great job regardless!!! Welcome to my world! lol! Wow CK, TW sure has messed things up. We want to see photos of you nomming that food. You can tell us you like it, but just posing with the cans and package is window dressing. We want to see the real deal. maybe we will think it looks interesting and want to try it, whether or not this is or isn't a review. At least she finally broke down and opened your package and then one of the cans. Purrs and hugs, Lily Olivia, Misty May, Mauricio, Giulietta, Fiona, Astrid, Lisbeth and Calista Jo. REally CK how could they expect a diva like you to shill a product for free? Never happen! hey WAIT. Cholesterol? I don' THINK so. Con-cat-ulations on your win! Truffles favorite is Fancy Feast, but we haven't tried the cheese pate yet. MOL! CK, we like how you made TW work for the photo-op...after all she did make you wait too long to open that package. I'm guilty of letting my packages sit there sometimes =X Unless I don't know what's inside and then I just have to open it because I'm curious. Glad you enjoyed your noms CK! Are you sure TW didn't eat the rest of the can? MOL! Trust the Humans to think a piece of wood is a prize. Honestly, what's *wrong* with them? And I hate to tell you, but LadyCats don't have packages. Not even small ones. Course, truth to tell, most of us ManCats don't either, anymore. Sniff. CK , you can be glad you got the content in the small package ! You know, your headline would be better if it said "MALE" call, cause, you know, I'd be right there. Small package?!?! SMALL package for the awesome CK?? Shameful!! 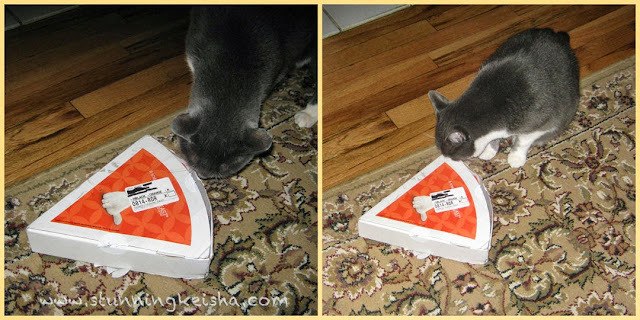 Glad you liked the fancy Feast though, that was an awesome prize to win!! one would think that TW has grown used to you celeb status...sheesh...who else would the package be for/??? ?